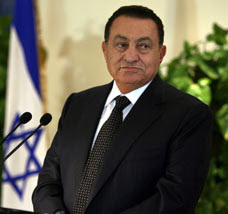 Egypt’s President Hosni Mubarak has been diagnosed with terminal stomach cancer, and is not expected to live beyond a year. After that, the uneasy equilibrium of Egyptian politics could be violently disrupted, with the possibility for escalation in the Middle East and beyond. The Islamic supremacist Muslim Brotherhood, from which sprang both Hamas and Al-Qaeda, could attempt to seize Mubarak’s death as an opportunity to try to take power in Egypt. Mubarak’s son Gamal, however, appears to be determined not to let that happen. It is by no means beyond the realm of possibility that armed conflict could result – conflict that could be the deadly match in the Middle East’s tinderbox. Officially, the Muslim Brotherhood is banned in Egypt, but its candidates often run in elections as independents – winning one-fifth of the seats in the 2005 parliamentary elections. Since the presidency of Gamel Abdel Nasser (1956-1970), the Egyptian government has practiced steam control with the Brotherhood, looking the other way as the group terrorized Coptic Christians and enforced Islamic strictures upon the Egyptian populace, but cracking down when the Brotherhood showed signs of growing powerful enough to actually seize power. Shortly before he was assassinated by members of another Islamic supremacist group that was enraged by his peace treaty with Israel, Nasser’s successor Anwar Sadat not only released all the Brotherhood political prisoners who had been languishing in Egyptian prisons, but also promised the Brotherhood that Sharia would be fully implemented in Egypt. But this is not enough. During the last months, these groups have been trying to take advantage of the difficulties our country is going through. By multiplying anti-Western references, they are building barriers between the different cultures. They are destroying the bridges between the Eastern and Western worlds that the past generations had so much trouble building. That is the worst thing that could happen. If the Brotherhood succeeds in imposing a strident Sharia regime in Egypt via a figurehead or weak ElBaradei presidency, the Camp David Accords, already much transgressed and ignored by Egyptian authorities, could be swept aside altogether. Egypt could follow Turkey’s path of a new belligerence toward Israel as it jockeys for power with the Saudis and the Turks among the major players of the Sunni Muslim world. If, on the other hand, it wins enough concessions from Gamal Mubarak and his ailing father to push forward its agenda with new energy, confidence, and power, an Egyptian Sharia state inveterately hostile to the United States and Israel is not necessarily forestalled, but merely postponed. Hosni Mubarak is the third in a row of Egyptian strongmen who have kept a lid on the Brotherhood’s power and preserved Egypt as a relatively secular republic for over fifty years. He could be the last. And the chaos that could follow in the wake of his death could spread far beyond the borders of what is still, at least putatively, the Arab Republic – not yet the Islamic Republic – of Egypt.